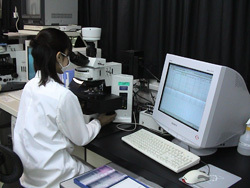 The Advanced Medical Science Research Center is engaged in three major operations: 1. Genomics research focusing on evaluation of effects of pharmaceuticals including anticancer drugs by genetic analysis technology, 2. Drug efficacy and safety evaluation by biomarker analysis using immunoassay and other technologies, 3. Drug efficacy/safety evaluation using cells, and cell function research aiming at establishment of new evaluation systems. All of our research and studies are in strict adherence to the laws concerning protection and management of animals with full respect of the standards concerning care and management of test animals, and have been accepted and certified for animal welfare practices.